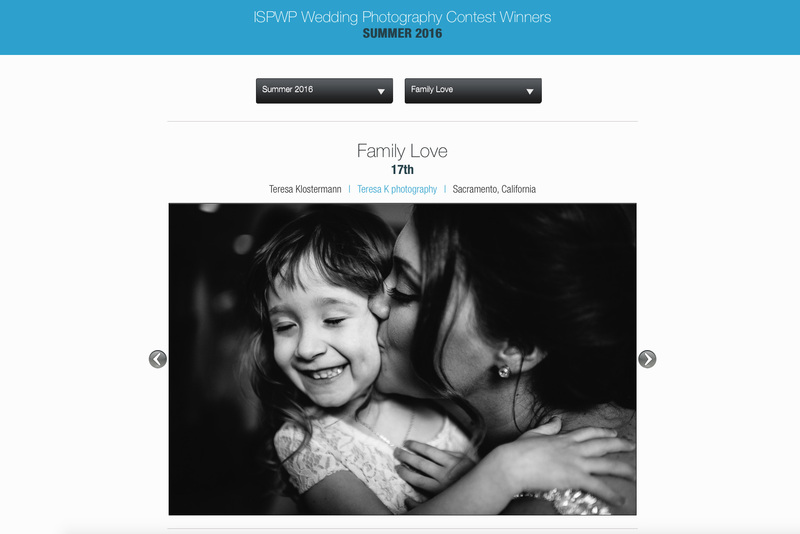 ISPWP Summer 2016 Photography Contest Award Winning Photo - Sacramento Wedding Photographers | Teresa K photography Facebook Twitter Instagram Pinterest Client's Area Search this site. Having one of your photographs acknowledged as “award worthy” amongst so many incredible entries is something that makes me feel pretty happy. I’m thrilled to have another ISPWP win under my belt with this super sweet moment between Laura and her flower girl right after she gave her a keepsake necklace. There’s so much about this photo I love from the connection between the two girls to the way she clutches her newly treasured gift. It’s moments like these that make me proud I get to call myself a wedding photographer! Check out all the contest winners here, I’m truly in great company! Experience: Members must have photographed a minimum of 50 weddings as the primary in-charge photographer. Weddings shot as a tag-along, second, or backup photographer do not count. This is the minimum experience requirement, many ISPWP members have shot hundreds of weddings. Talent: Members must submit a website/blog/portfolio for review by a panel of ISPWP members. Online portfolio galleries must demonstrate artistic and technical ability. The portfolio must display a minimum of three galleries of complete weddings. Galleries that only display “selected favorites” from multiple weddings will be rejected. Professionalism: Members must operate in accordance with the ISPWP Code of Conduct. This protects both the photographer and the client, and provides assurance to the client they are dealing with a professional who takes their business seriously.